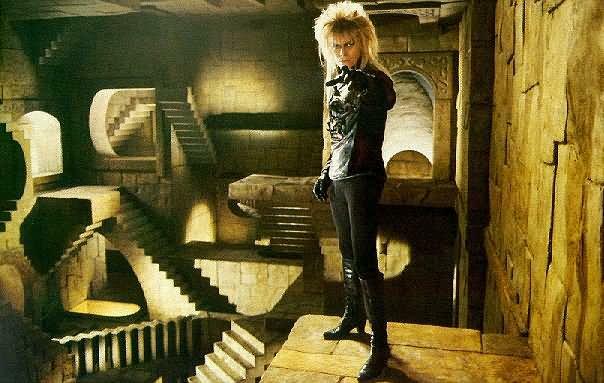 Labyrinth (1983) is a musical fairy tale about 16-year-old Sarah (Jennifer Connelly) who accidentally wishes her baby stepbrother Toby to the evil Goblin King Jareth (David Bowie) who will transform Toby into a goblin if Sarah does not complete his Labyrinth in 13 hours. At the end Sarah enters to the castle of goblin king which represents theme of Escher's artwork "Relativity". Also you can see video rolic with this episode.